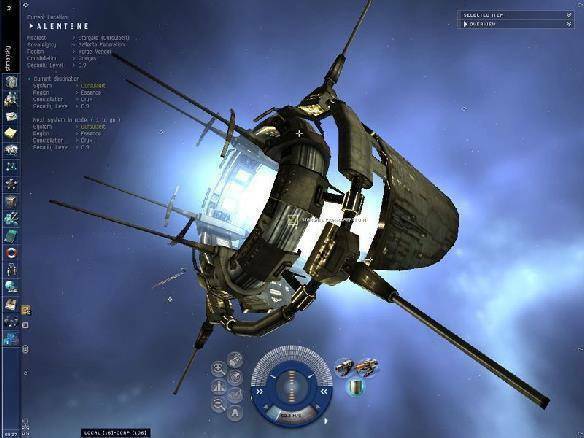 EVE Online is a Free to Play Space MMORPG genre game developed by CCP Games for Windows and Mac. Set in the distant future away from the original home world of Earth, the planet that has been lost to time, the humans of Earth discovered a new region of the Galaxy by travelling through a natural wormhole. Unsure of where this new alien region lay in terms of their own Galaxy they began to settle it and named this new solar system New Eden. Humans began to colonise but unexpectedly the wormhole gate collapsed and what is known of civilisation was stranded across the universe. In this massive, innovative space-based MMORPG you play as one of five different factions that have endured and risen up as mighty empires; the Gallente Federation, the Minmatar Republic, the Jovian Empire, the Amar Empire and the Caldari State. Starting from humble beginnings you as a pilot of your own ship will try to eke out a living under the protection of one of these empires, put your hand to mining, crafting, exploration and even piracy as you patrol the space lanes of this new world. In this ever-changing persistent universe is possible for one person to be a stone in the pond and their ripples felt across the Galaxy. With an unprecedented amount of customisation in various features of the game, from skill choices to ship and components used to modify and upgrade, it is possible to designed your character as best suits your preferred style of play. With a peaceful life as a trader, embracing the virtual player economy as you rise in notoriety you can develop and invent sought after this and much desired items and sell them on the Galactic marketplace or help fuel the constant war machine that rages on between the major warring factions. With such large-scale warfare huge alliances will band together to wrest control of various actual territories within the game, using the in game EVE Voice to orchestrate attacks and defences in massive PVP that is unparalleled in other MMORPG’s. The game is completely free to play, which includes all future expansions, players are able to pay for their game time by earning PLEX, the standard in game currency that is used by all players and can be earned simply by playing the game.